What is the Academic Resource Commons? 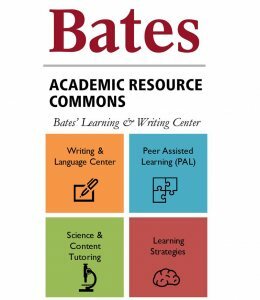 The Academic Resource Commons—or ARC, for short— offers academic support (peer tutoring, workshops, Supplemental Instruction) for Bates students. Why is ARC set up the way that it is? ARC is a centralized spot for academic support, where it’s easily accessed by students. As a unified program for hiring and training peer tutors, ARC can ensure that peer tutoring is being delivered at a high level of excellence, and in a way that lines up with best practices that have emerged at other colleges and universities. You can use ARC to study, do your homework, review your notes, or do any other work for your classes. You can ARC when you want to do this around other students who are currently in the same class, and you can use ARC when you want to be able to speak to others students who have been through the same course and have insight to share with you on how to do well in it. You can use ARC to spend more, and more focused, time on a specific concept than you would get to in class. And, you can use ARC when you want to enjoy a more active, social, collaborative learning experience than you’ll get anywhere else on campus. Is ARC a quiet study area? ARC is not a quiet study area. ARC is a lively, social, vibrant place for talking to other students about the work of being a student. The look and feel of the space is designed to be more like a coffee shop, or an open-floor-plan office, than a traditional library study space. This area of Ladd seems like a spot where I’d like to just study. Can I do that? Yes! This space is open to anyone looking to do any part of the work of being a student. The only differences from any other space is that you’ll be asked to log in when you enter the space, and that if you raise your hand, a tutor will come around to ask how they can help. What if what I really want is a quiet meeting with an expert one-on-one? We believe deeply in a highly social model of tutoring, where no one is the role either of expert nor of non-expert. We hope you’ll give it a shot. On the other hand, there will always be times, circumstances, and learners that make a one-on-one meeting the best option. Let us know. If your needs aren’t being met in the drop-in lab, it may be that a one-on-one appointment with a tutor, a session with professional Writing Staff, or another resource may be appropriate. We’ll do our best to figure out an alternate arrangement. Why do I need to log in to use the space? There are three reasons. First, we want to know patterns of usage, so that we can respond accordingly (for example, if we know that lots of students are logging in for Economics tutoring at a time when we only have one tutor working, that information will allow us to move things around to work better for the students who need help). Second, we want to know if our services work, so that we know how to make improvements. Third, components of ARC programming are funded by grants, and we collect information on utilization of our services so that we can let funders know how we’re spending their money. Peer tutoring means students helping students. Our tutors aren’t PhDs, they’re not experts, and they’re not professional tutors. They’re students who were in the same class as you a year or two ago, and who figured out some useful strategies for getting through it. ARC tutors are Bates students who have taken the class that they’re offering support for, and earned a high grade within it. They’re individuals with a high degree of empathy, and they’re great communicators. And, they’ve received training from ARC on peer tutoring pedagogy. ARC tutors are great role models for navigating the Bates curriculum. What if the help I need isn’t offered by ARC? How will I know where to go for help? Whatever you need, if it’s academic support, the front desk at ARC is a good place to start. The students at the front desk are knowledgeable not only about our services, but also services offered by our partners around campus. ARC is a one-stop for academic support, and we’re committed to getting you to the support that you need. You don’t! For most classes, you can just stop by. There are a few courses and topics that we do offer appointments for; stopping by ARC is also where to start to make an appointment. How do I know when help is available for my course? Hours of availability for each of the topics and subjects that ARC supports will are listed on the ARC Hours website. What if the class I need help in isn’t listed? Let us know. We don’t have the resources to offer support for every class at Bates, but if we know there’s demand for a course, we’ll do everything we can to meet it. Visit the employment page. We look forward to seeing your application!